Toddlers love to explore different materials. I set up this simple station at the table for New Kid. I chose a number of differently textured materials such as corrugated cardboard, felt, ribbon, cellophane, netting, etc., and put them on a large piece of contact paper which I had taped to the table. Sitting in his high chair, New Kid was free to explore the textures and materials. He also loved how his fingers stuck to the contact paper and had a great time pulling everything off the sticky paper and then putting it down again in a different spot. Be sure to supervise so your toddler does not put objects in his mouth. Anything else you can find, like fake flowers and leaves, tissue paper, tulle, etc. I did experiment with putting the sticky paper on the easel, but he preferred the table. This is a variation on the contact paper activity I used to do with Kiddo. We love contact paper in our house! Haven't done this particular activity with it – we should! WOW! 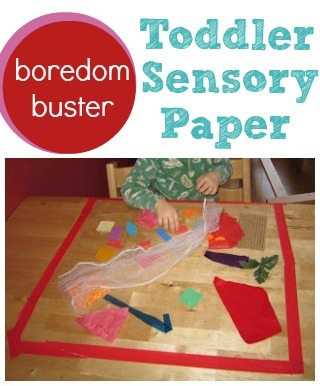 great activities with paper. Just thought I’d let you know I included a link to your sticky table on my personal blog. Such a cute idea! Thanks for the post!